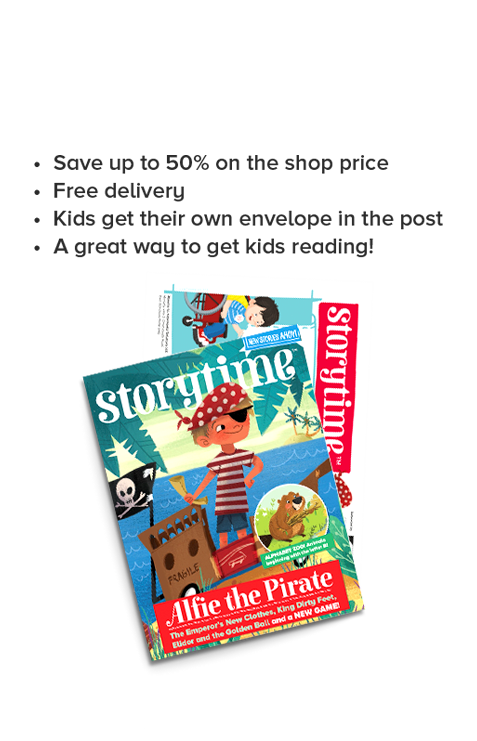 Welcome to Storytime, one of the UK’s biggest & best kids magazines. Give a year of stories to someone special! There are no adverts, no plastic toys, and each issue arrives in a special envelope, so children have the excitement of receiving their own post! Try it for yourself today! – we offer subscriptions all around the world, a whole year of stories makes a perfect gift. Great stories in a kids’ magazine to read, share, and treasure every month. Enjoy classic tales and discover new favourites too! A great way to get kids reading for pleasure. Traditional tales fit with the new curriculum. Colourful illustrations, activities & games bring them to life. Each issue is printed on high-quality paper so you can keep it and go back to their favourite stories. You can even store them in a special tidy file! Each issue is like getting seven brilliant books in one! Every month you get six magical stories for kids plus one or two poems, all beautifully illustrated. We have three brilliant books for you to win, Little Green Donkey by Anuska Allepuz (Walker Books), The One-Stop Story Shop by Tracey Corderoy and Tony Neal (Little Tiger Press), and Norm by Sylvia Liang. Enter our competition to be in with a chance of winning. School subscriptions now come with a monthly teaching resource pack, including fact sheets, lesson ideas, class games & activities. Plus we have free taster teaching resource packs to download on our school site – try them out today!